We're delighted to announce Keli Clark, one of Edinburgh's and East Lothian's better known artists, has been commissioned to illustrate the new Princess Pumpalot book. Keli's work encompasses a wide and varied range from: Scottish land and cityscapes, murals, works of magic and mystery, faeries, cats and birds. After this commission Keli can add a mummy, a werewolf and a bearded witch to her portfolio! A little Princess Pumpalot teaser for the 2018 Cadies Productions production of Princess Pumpalot: The Quest for the Purple Super-Farting Bean . AN Edinburgh school, after reading the children’s book, Princess Pumpalot: The Farting Princess, has come up with the novel idea to ‘use farts to power the school generator'. It’s understood one of the science classes has rigged up a hollow cylinder in the toilets to capture everyone’s farts in a hermetically-sealed container. Once enough gas is collected, it feeds directly into a power generator. We are delighted to announce details of our 2017 show. Princess Pumpalot: The Quest for the Purple Super-Farting Bean will be performed at Le Monde (Venue 47), 16 George Street, Edinburgh EH2 2PF as part of the 2017 Edinburgh Festival Fringe. The Wiffyville Gazette reports that Book TWO in the Princess Pumpalot series - PRINCESS PUMPALOT: THE SUPER-FARTING BEAN MYSTERY is to be published in May/June 2017. 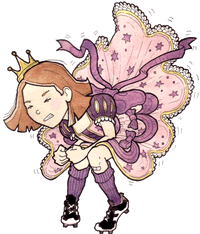 The second Princess Pumpalot: The Farting Princess book is under way with an amazingly original working title of "Book 2 (working title)". It's too soon to say when the book will be published but we're aiming for the first part of 2017.
REVIEW: Princess Pumpalot The Radio Show - Live on Stage! What a great review by Primary Times of our 2016 Edinburgh Festival Fringe production of Princess Pumpalot The Radio Show - Live on Stage! A BIG THANK YOU to everyone who has (so far) sent in a 'Pumpy Pose' photo for the Princess Pumpalot: The Farting Princess 'Pose Album'. Since the publication hit the book shelves in July 2012, we've been encouraging people purchasing a copy of Princess Pumpalot: The Farting Princess to strike a pose with the book (although we realise this is not for everyone). With over 260 photographs in the 'Pumpy Pose Album', our success rate is about 10% of all the purchased books.